Washington, D.C., Oct. 6 – RespectAbility, a nonprofit organization fighting stigmas and advancing opportunities for people with disabilities, has asked candidates for U.S. Senate on all sides of the aisle to fill out a questionnaire on disability issues. RespectAbility is nonpartisan and does not endorse candidates. The questionnaire is purely for educational purposes. This is important for Maine’s 206,00 citizens with disabilities. Only 32.6 percent of the 106,00 working-age people with disabilities in Maine are employed. Further, there are more than 22,000 youth with disabilities and each year a quarter of them will age out of school into an uncertain future. 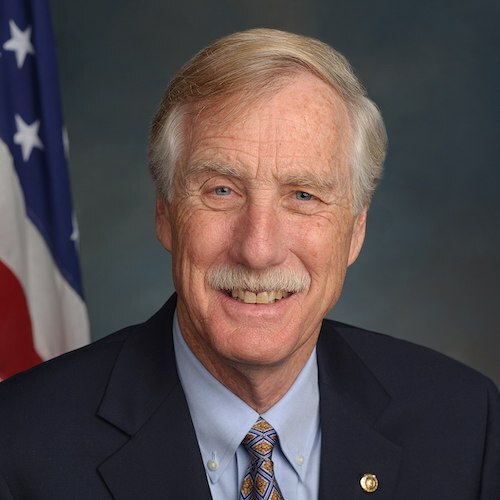 While incumbent Sen. Angus King, an Independent running for re-election to the U.S. Senate in Maine, did not answer RespectAbility’s questionnaire, he shared responses to a different questionnaire he completed on disability inclusion. We are presenting those answers below. RespectAbility also sent our questionnaire to the campaigns of Republican State Senator Eric Brakery and Democrat Zak Ringelstein. Senator Angus S. King Jr’s responses to another disability questionnaire are below. Question: Do you have designated advisors on disability issues? Have you already established policy proposals and/or clear processes for making decisions on disability issues? Please describe. Answer: Yes – I have policy staff members who advise me on issues related to individuals with disabilities. I also reach out to nonprofits and advocacy groups in Maine who focus on these issues to help advise me on how to best approach policy issues impacting people with disabilities. Question: Is your campaign accessible and inclusive to people with disabilities? Please describe. Answer: Yes. My three campaign offices in Brunswick, Bangor, and Auburn are all ADA-accessible, and my staff have made a point of making campaign activities, such as phone banking and volunteering in our offices, accessible to people with disabilities. Question: Describe your record of accomplishments (or history of advocacy) aimed at improving, or a plan to improve, the lives of people with disabilities? What makes this an important issue for you? Answer: Disability issues are important to me because the promise of America is rooted in equal access to opportunity for all. I have learned in public office that rather than approaching disability issues as separate from other issues of public policy, in order to be effective, I need integrate the interests of the disability community into each issue that comes before me. In addition, I have made a point of developing a close working relationship with disability advocacy groups in Maine and have turned to them for advice on a host of issues. As a member of the U.S. Senate, I have focused on several policy issues important to people with disabilities, including ways to better integrate people with disabilities into our workforce. I believe we are wasting a lot of great potential and talent when employers don’t recruit people with disabilities for open positions. I have also worked to improve the Social Security Disability Insurance program by reducing the wait time for individuals applying for the program. I have looked at the Affordable Care Act through the lens of how it supports people with disabilities, and I have fought Republican efforts to undermine and repeal the law. I strongly support the ACA’s protections for people with pre-existing conditions, and I have advocated on the Senate floor for protecting Medicaid and, the many people with disabilities who rely on the program for health insurance. Finally, I was a proponent of the ABLE Act, which was enacted in 2014 and creates tax-advantaged savings accounts for people with disabilities. The current environment in Congress and at the White House has meant that recent accomplishments on some of these critical issues have been hard to come by, and on many days it is a victory if I am able to work with my colleagues to prevent harmful policy from advancing. Even so, I remain firmly committed to advocating on behalf of people with disabilities to ensure that federal policies protect and support their interests. Question: What policies would you establish that address the employment issues and economic challenges that families and parents/guardians of disabled children and adults face (such as having to quit jobs to support family members)? Answer: I think the most effective step would could take would be to pass a federal paid family leave program. There are many ways this could be structured – a social insurance program, like Social Security, or through tax incentives to employers – but the important thing to emphasize here is that the United States is one of the few countries in the world that does not provide access to paid family leave. Access to job-protected, paid family leave would allow parents and guardians of children with disabilities the ability to take time away from work without fearing retaliation from their employers or losing their jobs. It would provide financial certainty so that people could care for their loved ones in need. I have cosponsored the FAMILY Act, which would create a universal paid leave program that would allow workers to earn up to 12 weeks of paid leave, and I believe it’s time for Congress to step up on this issue. Question: How will you insure that the letter and spirit of laws like IDEA and ESSA are followed in a manner that decreases the segregation of students with disabilities and increases inclusion? Do you support approaches such as Universal Design for Learning (UDL)? Answer: One of the most important things that we can do is to ensure that we hold education officials accountable and ensure they are appropriately implementing the laws that govern school policy. While I strongly opposed the nomination of Betsy DeVos to be Secretary of Education, I have and will continue to work to ensure that she and her department do not ignore IDEA and the protections in ESSA to ensure that students with disabilities receive a high-quality education and access to the support they need. I have been an advocate for Congress to take its oversight of the executive branch seriously – and I will continue to do so. Question: What is your position on school choice? Have you considered the ramifications of choice on students with disabilities? Answer: Educators and policymakers have debated the effectiveness of vouchers since my time as Governor, and I expect this conversation will continue well into the future. I think we have to consider school choice – particularly through methods like vouchers – with a great deal of caution, as we cannot risk shifting funds from our public schools unless we can be certain that student outcomes will improve. Public education is meant to serve ALL students – and I think we need to be very careful in considering the implications of school choice proposals on students with disabilities, English language learners, and low-income kids. Question: What is your position on Maine’s pending application for a Section 1115 Medicaid waiver, and what do you predict will be the likely impact on Mainers with disabilities and their families? Answer: First, it’s important to remember that many people on the Medicaid program are already working. As this is not a decision over which federal lawmakers have a role, I cannot appropriately weigh in on what is ultimately a decision for the Department of Health and Human Services and the LePage Administration to make. What I can say is that if states want to introduce work requirements to programs like Medicaid, it is important to be very thoughtful in their design. In Arkansas, it was recently reported that thousands of people have been dropped from their Medicaid program due to the introduction of work requirements. Many medical professionals and legal services advocates have argued that the logistics of complying with and reporting on work requirements can make it extremely difficult for fully-qualified low-income people to demonstrate their employment status. While much depends on how Maine might implement such a requirement, I would be concerned about inadvertently hurting some of the most vulnerable members of our communities – people with disabilities, seniors, and children – through the introduction of work requirements that provide little, if any, benefit to beneficiaries or taxpayers. Question: President Trump has proposed increasing institutionalization for people with mental health disabilities as a solution to gun violence. Would you support this approach? Why or why not? Answer: No. People with mental illness are no more likely to be violent than anyone else, and I believe it is a terrible idea to return to a time when we over-institutionalized people with mental illness. Question: What is your position on HR 620 – The ADA Education and Reform Act? Do/did you support it, or any other ADA notification legislation? Answer: I am a strong proponent of the Americans with Disabilities Act (ADA), which has provided critical protections and expanded accessibility for those living with disabilities, since it was signed into law over a quarter-century ago. I will adamantly resist any efforts to roll back the progress made by this law. While H.R. 620 has not yet been introduced in the Senate, the barriers it would create for people with disabilities seeking justice are of great concern to me and I will stand opposed to any Senate legislation that would seek to make similar changes. I will continue to look for ways in which I can facilitate constructive conversation around this issue to ensure that my colleagues on both sides of the aisle understand the importance of preserving the protections offered by the ADA. Question: Would you support Medicaid cuts, block grants, and/or caps as a way of cutting the federal share of health care costs? Question: How do you plan to address the increasingly long approval process for people applying for SSDI? Answer: I hear often from constituents in Maine about the lengthy process of applying for Social Security Disability Insurance (SSDI). In addition to directing my staff members in Maine to advocate for constituents’ rights during this process, I have also weighed in with the Social Security Administration (SSA) to push successfully for reforms to speed up the SSDI adjudication process. Because of work I pursued along with other senators, the SSA now provides applicants with 75 days advance notice of their appeals hearing date, a change that should reduce the number of hearings that applicants need to postpone due to scheduling conflicts or insufficient time to gather medical evidence. Additionally, I have consistently urged my colleagues on the Appropriations Committee to adequately fund the account that pays for staff at SSA hearing offices and field offices. Question: What is your position on ACA repeal? Are you aware of the concerns among members of the disability community and their families? How will you guarantee that those with pre-existing conditions continue to have access to affordable care? Would you support changes to Medicaid as a part of ACA repeal/replace? What kinds of changes? Answer: I am and have been firmly opposed to repealing the Affordable Care Act (ACA). I believe the ACA has been a success, and I am dismayed by the Trump Administration’s efforts to dismantle and undermine the law. In part because of the protections for people with pre-existing conditions, I am convinced we need to protect and strengthen the ACA. I do not support substantial changes to the Medicaid program – either as a part of ACA repeal/replace or separately. Question: How will you protect services for people with disabilities, and other vulnerable groups following recent tax reform legislation? Answer: I am concerned that the increases to the federal debt as a result of the recent tax reform legislation will lead to members of Congress to call for cuts to important programs that serve people with disabilities and other vulnerable groups, such as Medicaid, Medicare, and Social Security. I intend to fight those efforts at every turn – these programs are important to the people of Maine, protect vulnerable members of our communities, and prevent widespread poverty, illness, and hunger. Question: Would you consider immigration as a possible tool in decreasing workforce shortages across caregiving professions (esp. related to care/support for older and disabled Mainers)? Question: Are you aware that many of the 13,000 Mainers on the Section 8 housing wait-list – which can last more than 10 years – are seniors and people with disabilities? What are your plans for addressing this and other barriers to housing? Answer: The lack of affordable housing in Maine is one of the most serious challenges facing our state. To address this problem, this year I joined my colleagues in sending a letter to the leaders of the Senate Appropriation Committee’s Subcommittee on Transportation, Housing, and Urban Development urging it to provide $22.8 billion for Section 8 Tenant-Based Rental Assistance (TBRA) and $2.8 billion to the McKinney-Vento Homeless Assistance Grants. Strong support for these two programs—along with other critical housing programs through HUD—will significantly help the effort to quickly and permanently shelter the chronically homeless, prevent and end homelessness for veterans, and prevent and end youth, child, and family homelessness. I have also cosponsored bipartisan legislation to expand the Low-Income Housing Tax Credit, which could allow for the creation or preservation of more affordable housing units. I also introduced the Senior Home Modification Assistance Initiative Act, S.913, which could help more seniors age independently and safely in their homes by requiring the federal government to do a better job coordinating its existing efforts and programs for home modifications for seniors. While these programs are important, it’s clear that there’s more work to be done, and I am committed to be a partner to the disability community in finding solutions to the housing issues that too many Maine people face. Question: Do you support legislation designed to increase access to Home and Community Based Services (HCBS) – rather than institutionalization – for seniors and people with disabilities, such as S.910, the Disability Integration Act, or the EMPOWER Care Act? Answer: Broadly, I believe that government services should be made as accessible as possible for everyone, and as such, I support S.910’s goals of allowing people to remain in their homes and receive home and community-based services rather than being institutionalized. Especially in rural states like Maine where care facilities are often few and far-between, policy changes like this are incredibly valuable in both reducing costs and—more importantly—helping people stay in their homes. As you may know, the bill is currently awaiting consideration by the Committee on Health, Education, Labor, and Pensions; I intend to follow my colleagues on the Committee’s work on the bill, and I will look forward to it being considered by the full Senate.